Description: A GP60M sits alone awaiting its next job. Description: BNSF 7031 east stops for the signal at Merrick then BNSF 147 also stops while waiting for BNSF 5089 east to go by. All three line up to go to the Topeka sub as all eastbounds were being rerouted that way because of track maintenance. Many eastbound were getting back up at Emporia on the Emporia sub and all the way to Topeka on the Topeka sub that morining. This is a rare photo opportunity. Description: Burlington Northern Santa Fé. 147 is the lead unit on a local freight train stopped on the siding in front of the Amtrak station. Description: Burlington Northern Santa Fé & Amtrak / San Joaquin. BNSF 147 westbound stopped on the siding while AMTK 94 passes westbound approaching the station. 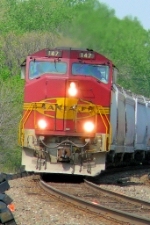 Note - 147 is in the Santa Fé red/silver warbonnet colours; 2947 is in the Santa Fé blue/yellow warbonnet colours; 2806 is in Burlington Northern green. Description: Burlington Northern Santa Fé. 147 parked in the yard. Description: Leaving the industrial park. Description: BNSF local working the CR Minerals plant across from the tank farm. Description: Local power about to leave Conejo.